Affordable medical care is now available to the public at the NewBridge Services center in Parsippany. 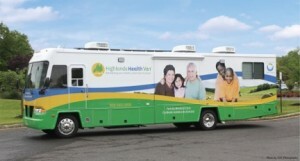 Zufall Health will bring its Highlands Health Van to NewBridge the first and third Tuesdays of each month, starting tomorrow, from noon to 5 p.m.
A Zufall advanced practice nurse and other medical professionals do physicals, treat illnesses and injuries, offer preventive care and health education, and make referrals to specialists. The van has two exam rooms and an intake/waiting area. Zufall Health will provide medical care the first and third Tuesdays of each month at NewBridge Services’ Parsippany location. If you need medical care, you may schedule an appointment by visiting NewBridge’s Parsippany center at 1259 Route 46, Building 2, or by calling (973) 316-9333. Walk-ins are welcome. The NewBridge center in Parsippany is easily accessible from routes 80 and 287 and serves Morris County and surrounding communities. Medicaid, Medicare, Family Care, and private insurances are accepted by Zufall. Fees for patients without insurance are based on income to make medical care affordable. Zufall Health is a fully licensed, Federally Qualified Health Center (FQHC) that provides high-quality, affordable, compassionate medical and dental care to residents of Morris, Sussex, Hunterdon, Warren, Somerset, and Essex counties. Visit Zufall Health’s website for more information. NewBridge Services is a nonprofit provider of counseling services, housing and educational programs in northern New Jersey, serving more than 8,500 children, adults and seniors each year. NewBridge offers individual, family and group counseling at the Parsippany center. Visit NewBridge Services’ website for more information. The Highlands Health Van is able to provide affordable health care thanks to a grant from Johnson & Johnson corporation.